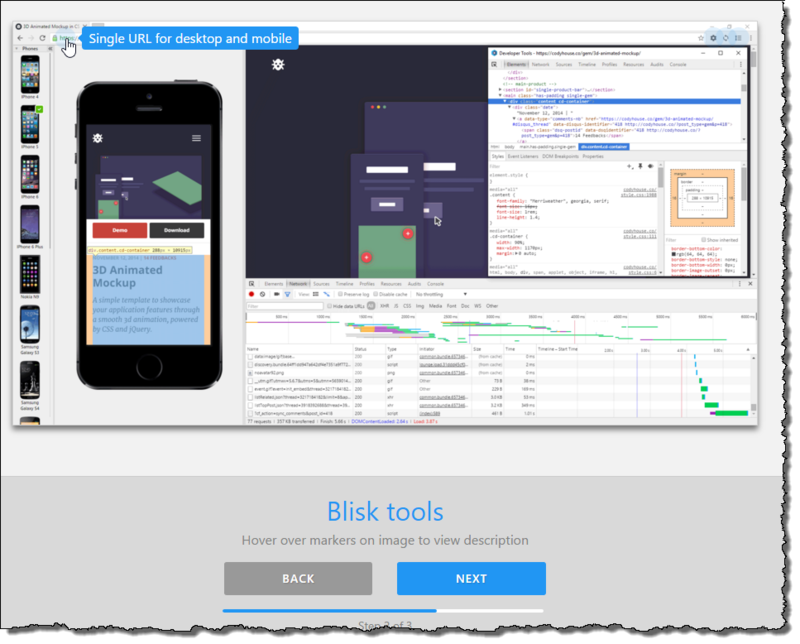 On the twitternet last Friday afternoon I saw this thing called “Blisk – a web developer’s dream come true” and frankly that sounds like fun ! and that lead me to “https://blisk.io/“. This is a record of my first interaction with it and see how it goes. This is not a review – this is just a record of OOOO shiney in action !! I downloaded it – I am not entirely sure that is asked me if I wanted do anything after I ran the installer…..Windows only right now apparently. 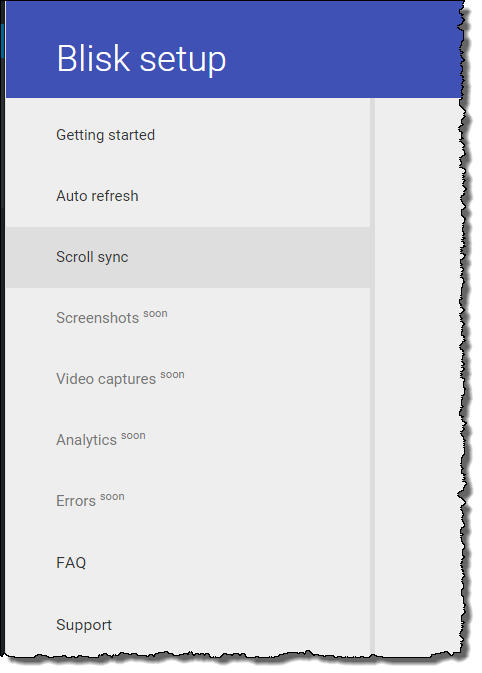 can’t figure out how to make the mobile device change orientation though yet…. and this is the result – SO COOL !!! 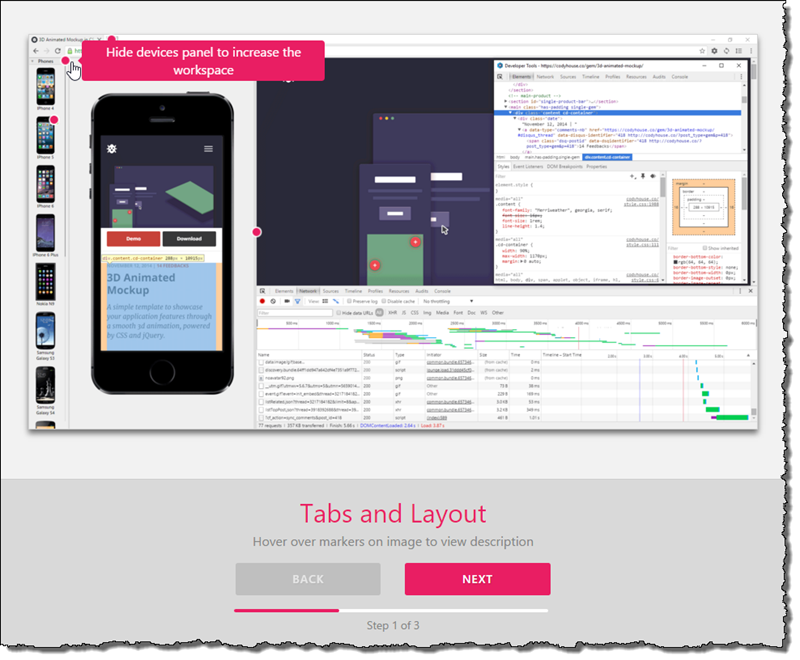 Because it is chrome (I mean webkit) and because I can, I was poking around and I discovered that the watcher functionality has actually been installed as a built in chrome extension – chrome.tabs.watcher. Very nicely done guys !!! So that’s about it so far – needless to say I am going to be watching this one very intently – even if this doesn’t work out, it will certainly kickstart the imagination of others – bravo ! I delighted to say that at very short notice, I am speaking at the Collab365 Summit virtual conference on May 11th 2016. 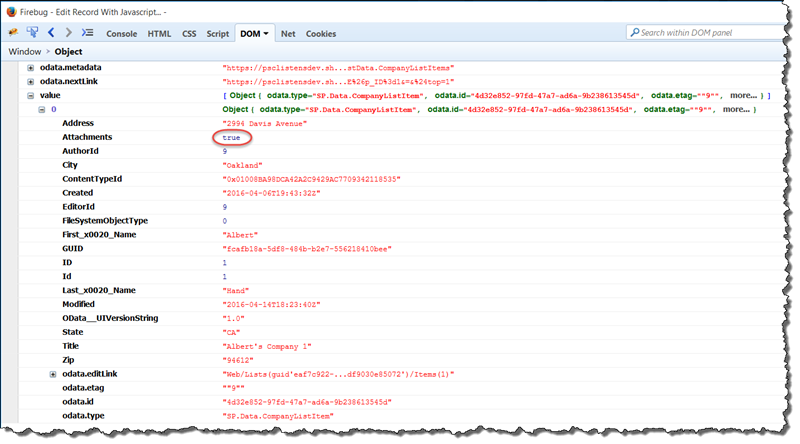 A web developer’s exploration into the capabilities and integration opportunities exposed by O365 and the Office Add-In model. Like most office workers, we all spend a significant amount of time in our “Microsoft Office” productivity tools. Even email is still a productivity tool. Productivity starts to diminish though if we have to move outside of our Office environment and hunt for information and/or complete business workflow processes. In this presentation Mark will provide lots of demonstrations of how to get started with Office Add-Ins. These will include: creating your first Add-In in under 2 minutes, how to simplify workflow approval without having to leave your email client, how to pull report and analytics data into your Office product suite applications and how to integrate your content with cognitive analytics. All of this, written without a single line of C#. 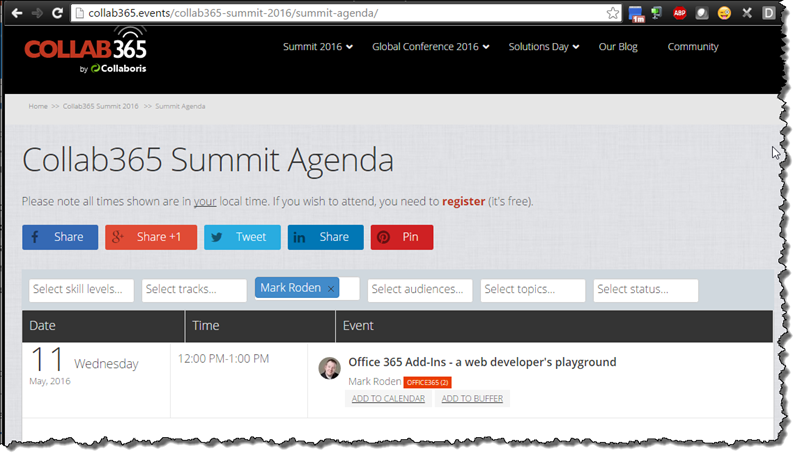 Come to the presentation and find out why Office 365 Add-Ins are a modern web developer’s playground. 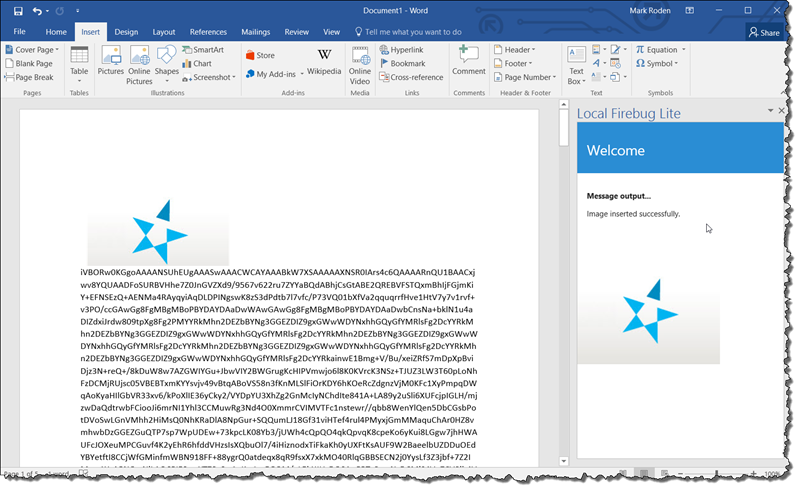 In this article I will briefly touch on the new Dialog API, the fact that it works in Outlook and that you need to have the most recent version of Office 2016 to get this to work. This is a really nice UX item added to the Office 365 Add-In suite of functionality. If I need to ask the user to interact with the application and/or make a decision, it is now available right there from within the Add-In. 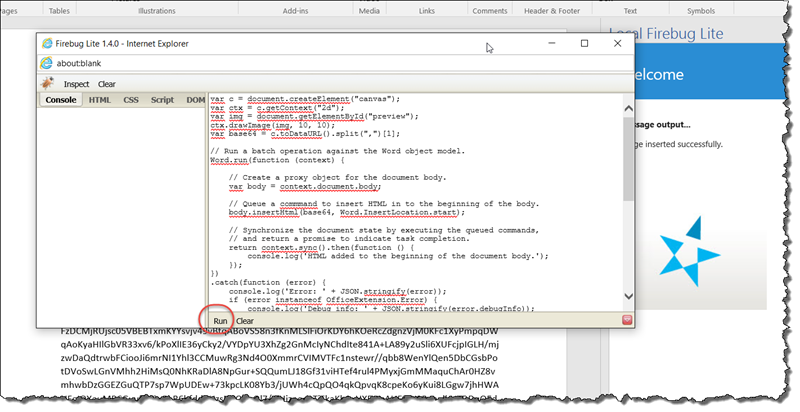 While Simon’s example was created in Word, using the following code it was really simple to test and see if it was available in Outlook as well. 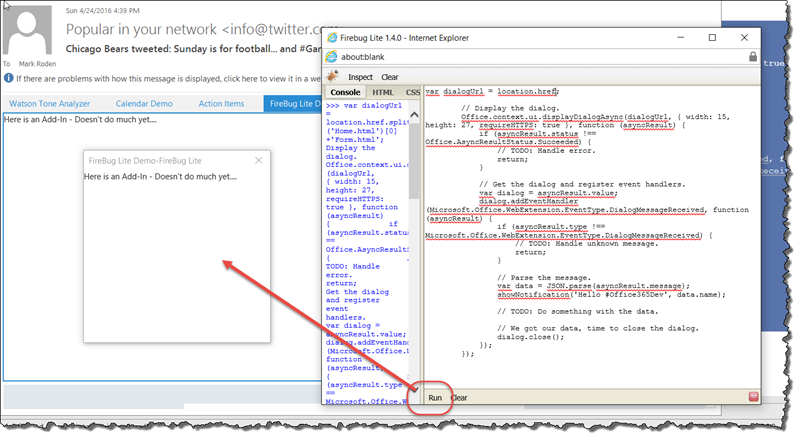 I used my firebuglite Add-In example to quickly load up an existing Add-In and paste the code into the console window. Took 2 minutes to verify which was great. // Get the dialog and register event handlers. // TODO: Handle unknown message. // TODO: Do something with the data. // We got our data, time to close the dialog. I wasted over a day being frustrated with why my code would not worked, and it turns out that my version of Office was not up to date. You need to go to the following site to download the latest version of Office (https://github.com/OfficeDev/Office-Add-in-Commands-Samples/blob/master/Tools/LatestOfficeBuild.md). 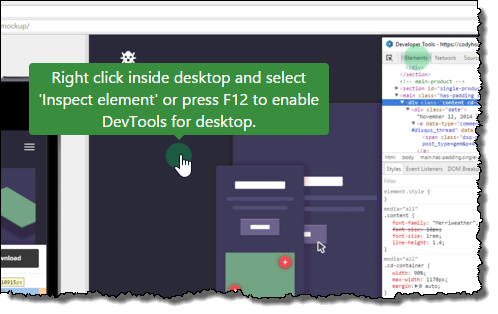 The new Dialog API presents a new option for developers in their continued ability to bring functionality into the Office 365 environment. 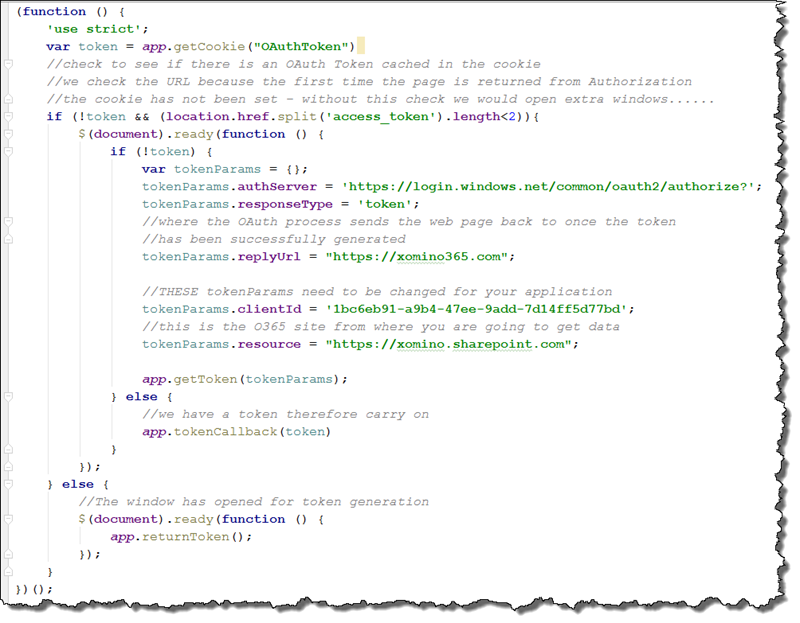 In this article I will show how I extended my method for generating an O365 OAuth token and incorporated it into a chrome extension. When I created the O365Token project on GitHub it was for the express purpose of being able to generate an OAuth token for an O365 Add-In project. 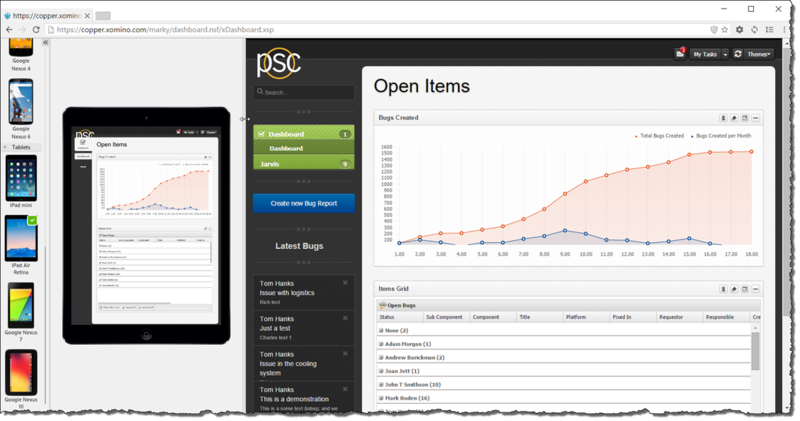 I have since been tasked with integrating O365 into an application via a Chrome Extension. Using the same methodolgy it turned out to be relatively simple to do. 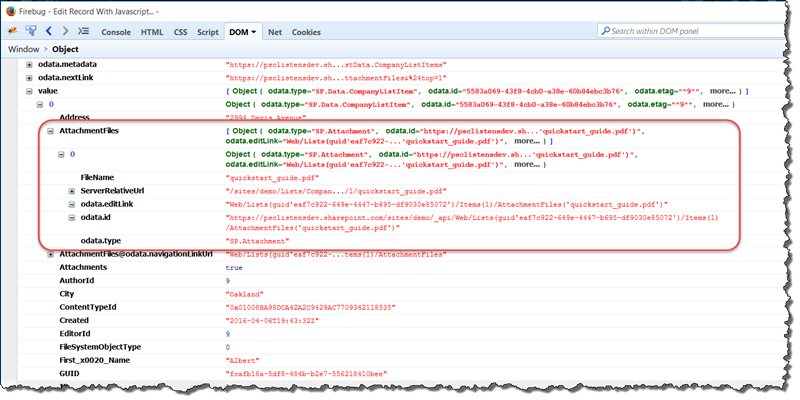 and when I visit an https://xomino365.com site I see the extension log in the console. 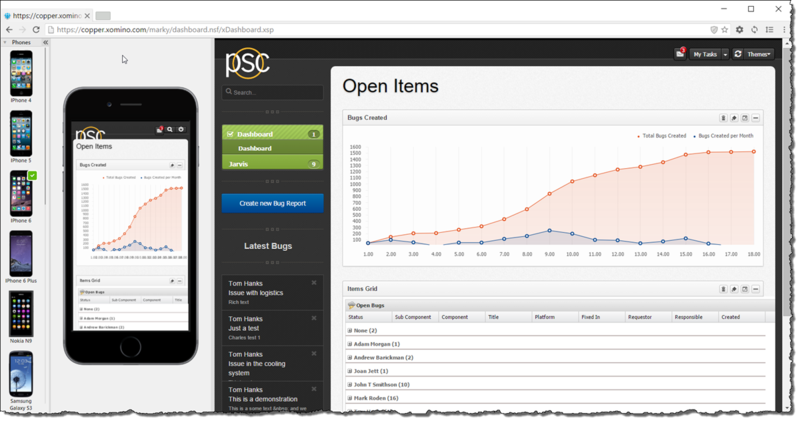 In the github project we have two files, Home.js and App.js. These two files are added to the chrome extension and the folder structure. The Home.js file is modified with the necessary parameters for generating the OAuthToken as described in this previous article. I also modified the replyURL as in this case it is not an Office Add-In. You will also notice that I changed the first few lines of code to remove the call to Office.js. 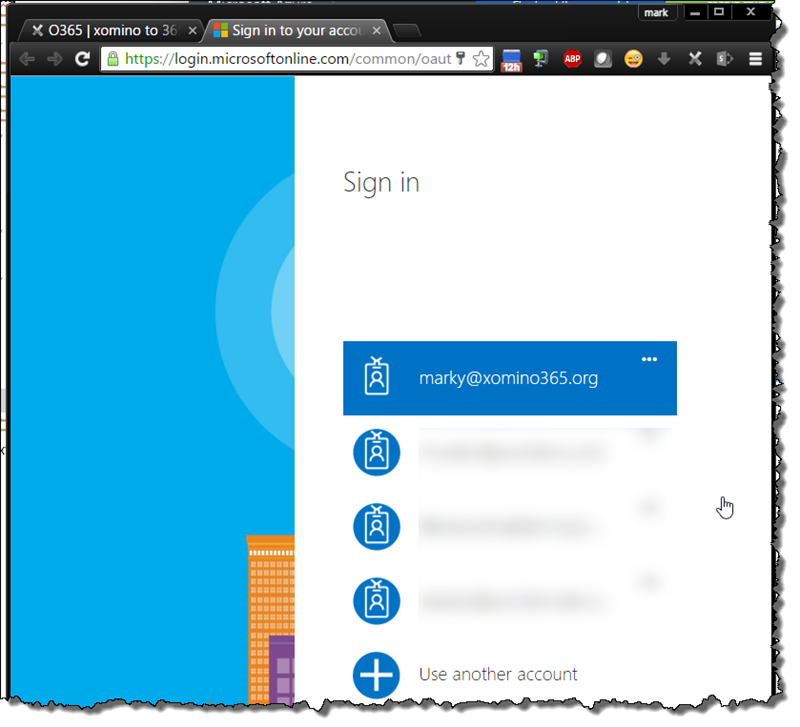 Once the code has been implemented, I go to a https://xomino365.com webpage and I am immediately prompted with a new window requesting O365 Authentication. 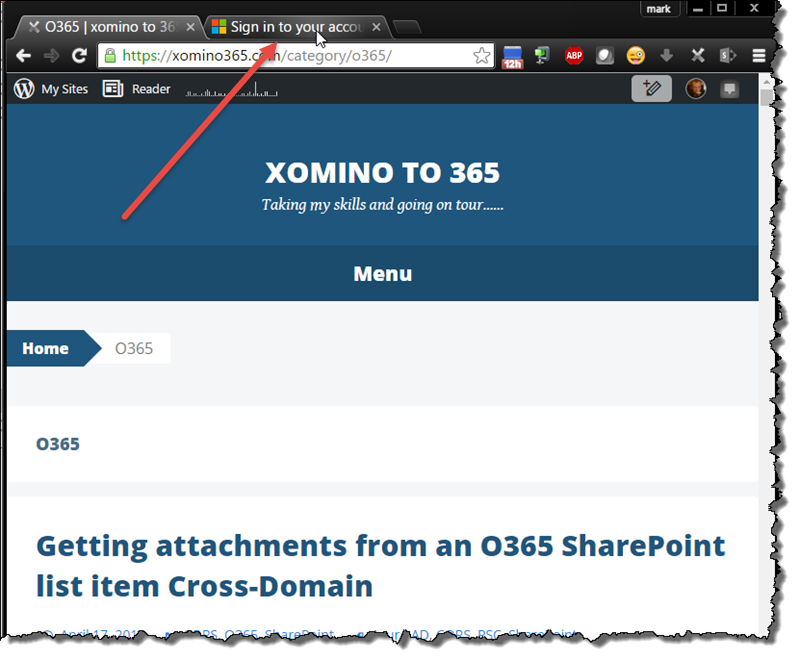 Once I authenticate, an OAuthToken is created and set as a cookie within the xomino365.com domain. 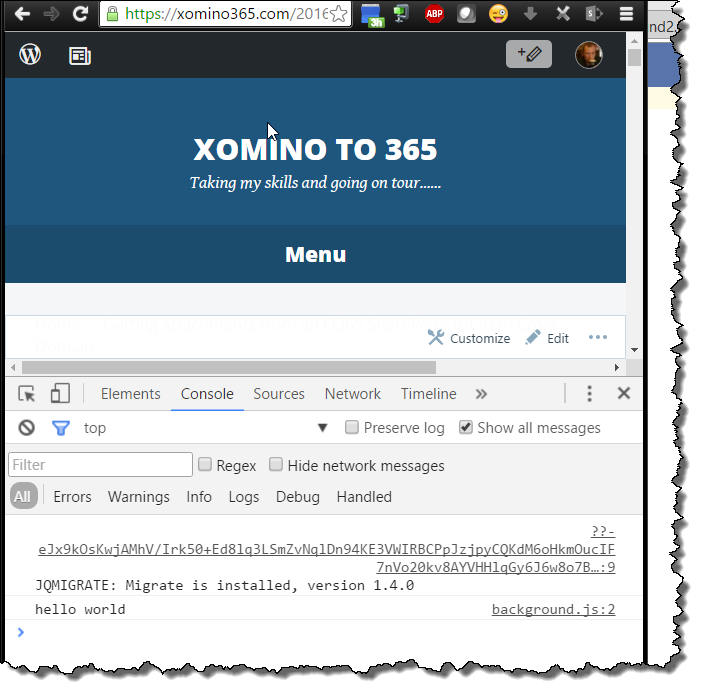 Using this I can then add O365 application data into my xomino365.com website seamlessly. Because of the ability to “match” the website which this occurs in, within my extension, this functionality will only appear on this website. I have updated the O365Token Github site with the Chrome extension as a separate folder within the repository. 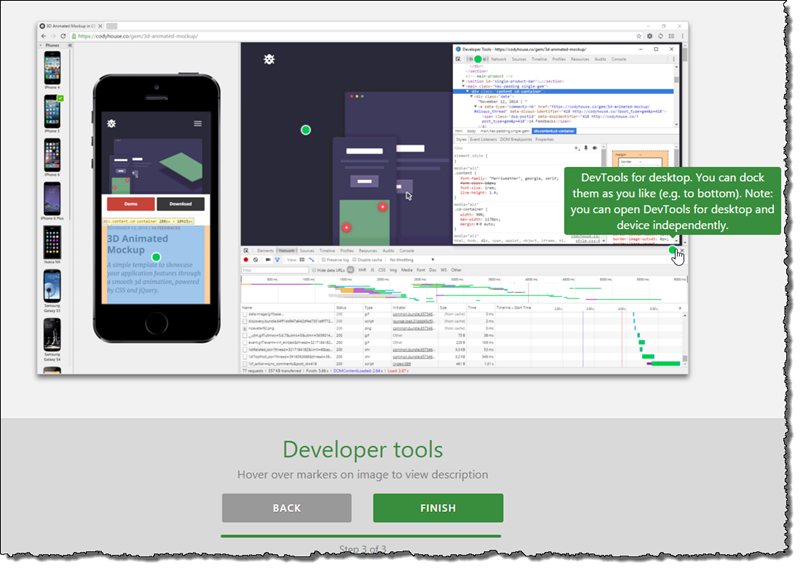 Please feel free to try it out for yourself with your own O365 sites. 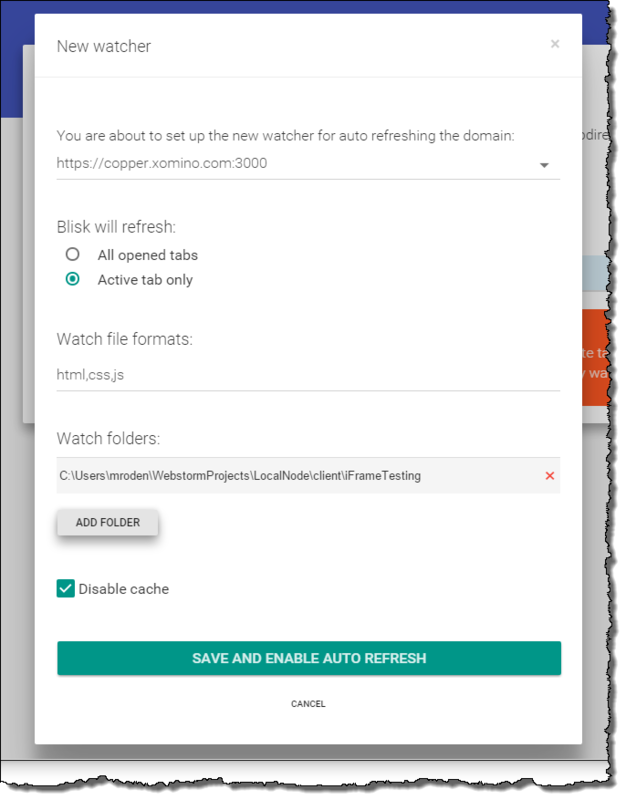 In this article we have seen how a simple Chrome Extension is constructed and how we can add O365 Authorization capabilities to it. 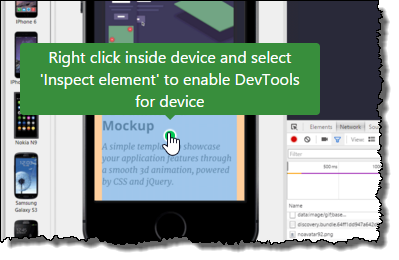 The ability to easily integrate O365 through a Chrome Extension opens up the future possibility for integration between existing applications and O365 through the use of DOM insertion. More on this in a later article.